SafetyDriversEd.com is proud to be a part of your Driver's Education experience. SafetyDriversEd.com provides its service to you subject to the following Terms of Service, which may be updated by us from time to time. You may review the most current version of our terms of service at any time. By accessing, using and browsing this website, you acknowledge that you have read, understand and agree to our Terms of Service. SafetyDriversEd.com provides it users with an interactive, high caliber driver's education course with cutting edge technology. We issue CA DMV approved driver's education certificate of completion. We provide current information related to CA teen driving rules and regulations. 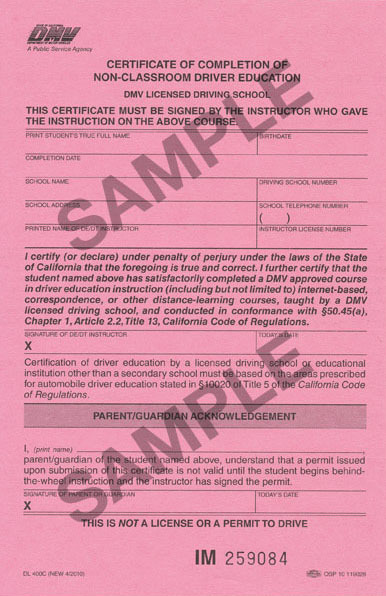 You understand and agree that the SafetyDriversEd.com is in accordance with CA DMV and must adhere to keeping necessary records of student information including legal name, birth date, address, phone, records of payments and course completion information. You understand that SafetyDriversEd.com may send you messages regarding new CA laws and other driving related topics. You understand that SafetyDriversEd.com is only approved in the state of California. You understand and agree that the Service is "As-Is." No warranties are made and we do not warrant that the site will be uninterrupted or error free. You are responsible for obtaining access to the Service and that access may involve third-party fees (such as Internet service provider or airtime charges) in order to complete the Service. You are responsible for those fees, in addition you must are responsible for all equipment necessary to access the Service. SafetyDriversEd.com does not guarantee that you will pass your permit test. The information of this course is accurate to the best of our knowledge. We highly recommend that you read the CA DMV Driver's Handbook prior to taking your written test. In consideration of your use of the Service, you represent that you have your parent or guardian's permission and also agree to provide true, accurate, current and complete information about yourself as prompted by the Services "Enroll Now" registration process. If you are under 18 years old, you must have your parent or guardian's permission to register for this service. SafetyDriversEd.com issues certificates of completion upon successful completion of the course. These DMV approved certificates are proof of completion for the driver's education requirement for the state of California. Certificates of completion are issued through Bay Area Driving School, license #2559. DMV requires complete, legal name (as on birth certificate or passport) on driver's education certificate of completion. Also, if you have provided untrue, inaccurate or incomplete information, SafetyDriversEd.com is not responsible for certificate name not identical on birth certificate or passport. SafetyDriversEd.com is not responsible for lost or misplaced certificates of completion. There is a $20.00 fee for duplicate certificates. You will receive a password and username upon completing of the Service's registration process. You are responsible for maintaining the confidentiality of the password and account. You understand that you are required to complete the course and tests. You are not allowed to have another person complete the course or tests for you. You agree not to reproduce, duplicate, copy, sell, trade, resell or exploit for any commercial purpose, any portion of the Service. SafetyDriversEd.com reserves the right at any time to modify the Service with or without notice. You acknowledge and agree that the Service contains proprietary and confidential information that is protected by applicable intellectual property and other laws. You also acknowledge and agree that content contained in the Service or information presented to you through the Service is protected by copyrights, trademarks, service marks, patents or other proprietary rights and laws. SafetyDriversEd.com grants you a personal, non-transferable and non-exclusive right to use the Service, provided that you do not (and do not allow any third party to) copy, modify, create a derivative work from, reverse engineer, reverse assemble or otherwise attempt to discover any source code, sell, assign, sublicense, grant a security interest in or otherwise transfer any right in the Service. The SafetyDriversEd.com trademarks, service marks and course content and graphics are products and service names of SafetyDriversEd.com and Bay Area Driving School. Without SafetyDriversEd.com's prior permission, you agree not to display or use in any manner the SafetyDriversEd.com Marks. The Terms of Service constitutes the entire agreement between you and SafetyDriversEd.com and governs your use of the Service, superseding any prior agreements between you and SafetyDriversEd.com with respect to the Service. The relationship between you and SafetyDriversEd.com shall be governed by the laws of the State of California, United States of America without regard to its conflict of law provisions.